Konvektsioonahjud pagariäridele, parim kvaliteet otse Itaaliast! High output and top quality. Ideal for large bakeries and pastry businesses. Bread, pizzas, puff pastry, sponges, cream puffs, biscuits, panettone, yeast-raised products, croissants and fine pastries: you can customize your recipes using the practical electronic control panel, which has 99 programs, allowing you to cook in 4 stages. The programmable delayed start feature means you can decide beforehand what time you want to prepare your dishes, customizing the cooking process with the direct steam option. The 10 600x400mm trays make the EKF 1064 TC oven an ideal tool for bakeries and pastry businesses producing large batches. With three speed settings and two cooking modes – convection and combination convection/direct steam – it has space for storing 240 recipes with 9 cooking steps each. The use of latest generation insulating materials and led lighting helps make this an energy-efficient appliance. 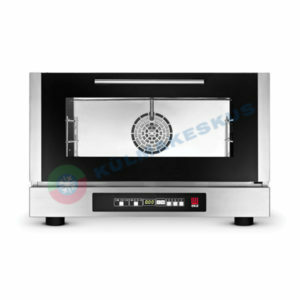 The 4 automatic cooking chamber wash programs have been specially designed for reduced environmental impact. It is the most powerful oven for pastry businesses and bakeries in the new Touch Line range: 16 pans measuring 600×400 mm can be slotted into a practical removable trolley featuring an ergonomically designed grip and lockable castors. It has a circuit board allowing you to store 240 recipes, each with 9 cooking steps. The Touch Control panel has an extremely intuitive interface to make preparing even particularly elaborate desserts quick and easy. High-quality materials and 5 fans arranged along the full height of the oven wall combine to ensure even cooking. It is the most powerful oven for pastry businesses and bakeries in the new Eka Evolution Line range: 16 pans measuring 600×400 mm can be slotted into a practical removable trolley featuring an ergonomically designed grip and lockable castors. 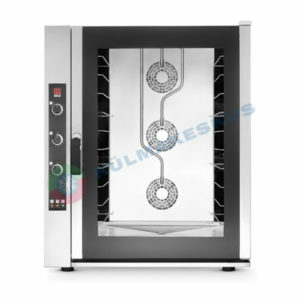 High-quality materials and 5 fans arranged along the full height of the oven wall combine to ensure even cooking. Pizzas, bread and fine pastries: use it to cook large batches without sacrificing precious time. Its high performance makes it the ideal ally for any professional in the bakery and pastry business. Sturdy and reliable, it gives you unbeatable freedom to adjust cooking to suit your different needs thanks to the direct steam option. Designed for small food outlets who want to heat frozen bread or bake sweet snacks and Danish pastries using a product that packs innovative features into a compact design. The digital display with storage for 99 programs and 4 cooking options gives you the utmost freedom when it comes to managing your preparations. The programmable delayed start feature means you can decide beforehand what time you want to bake your dishes, further customizing the cooking process with the direct steam option. A versatile, functional, hi-tech oven that finds application in a whole host of different settings: from bars to pastry shops, from bakeries to sweet snack takeaways, there is no outlet where EKF 443 D UD doesn’t feel right at home. Do not let its small size fool you: this is an effective tool for baking or reviving Danish pastries, doughnuts, muffins and cupcakes. Digital controls, direct steam and a stainless steel chamber allow this oven to meet the requirements of even the most demanding bakery. The 480x340mm trays are also perfect for preparing demi-baguettes (46cm). 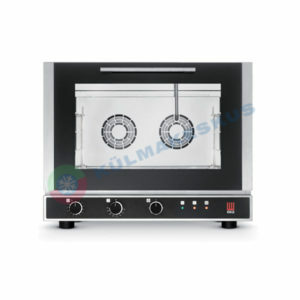 A versatile and functional oven with limited dimensions and capacity of four trays 600×400 mm. An effective tool for baking bread, pastries and small cakes. Handy use and quality. It bakes plain and filled croissants and is a valuable ally when you want to heat and revive the fragrance of frozen bread: its natural habitat is the small bakery or pastry business where space is invariably at a premium. Despite its compact design and foolproof use, the EKF 464 UD oven – with its direct steam option allowing you to customize each recipe based on individual baking requirements – will reward you with professional results while keeping cooking time and energy usage to a minimum. A compact oven with all the technology of Touch Line: direct steam with automatic setting, capacity of 4 trays, touch control panel with the possibility to store up to 240 recipes, delayed switching, rapid cooling of the cooking chamber, stackable, predisposition to manual and automatic washing. 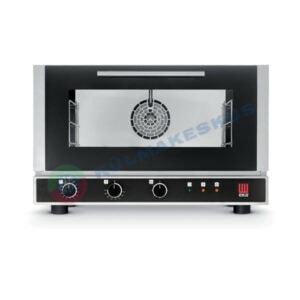 These are just some of the many features that come with this oven that will allow you to bake leavened products and fine pastries like bread products with the guarantee of excellent results .